Astounding Science Fiction started life as a pulp magazine, but by the latter half of the 1940s it had moved upmarket. It was printed on thinner, better quality paper in a smaller paperback-style format. The covers, as you can see from the examples above, were considerably less garish than pulp magazines of the period such as Planet Stories. Astounding’s writers tended to be more thoughtful and sophisticated than their pulp counterparts, too – and so were its readers, to judge from some of the letters printed in the magazine. Perhaps the most famous of these appeared in the November 1948 issue (the one with The Players of Null-A on the cover). I’ve written about it before, in Science Fiction Prophecy – but that was 12 years ago now, and it’s bang on topic for this blog, so I thought I’d mention it again. The letter in question was written by Richard A. Hoen of the University Club in Buffalo, New York. When I wrote the first piece I knew nothing at all about him, but according to an obituary that appeared in 2010, he was a 20-year old student when he wrote his famous letter. At first sight it was nothing special – just his personal ratings and a few other comments on the stories that featured in a particular issue of the magazine. A lot of “letters to the editor” took that format. The extraordinary thing in Hoen’s case was that the issue he was critiquing was the one dated November 1949 – exactly 12 months after the issue his letter appeared in! Spookily enough, when November 1949 duly came around, that month’s Astounding bore an uncanny resemblance to Hoen’s description of it. But that wasn’t because of any great precognitive powers – or the possession of a time machine – on Hoen’s part. If that had been the case, then the match between his description and actuality would have been perfect, or nearly so – but in fact there are several major discrepancies. Basically the match is as close as the magazine’s editor, John W. Campbell, Jr., could make it! So what aspects of his prediction did Hoen “get right”? Quite a few, as it turns out. All three short stories listed by Hoen are there in the actual magazine: “Final Command” by A. E. van Vogt, “Over the Top” by Lester del Rey and “Finished” by L. Sprague de Camp. 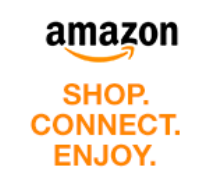 So is the novelette, “What Dead Men Tell” by Theodore Sturgeon. Hoen mentions two non-fiction articles, by R. S. Richardson and Willy Ley. There’s nothing in the actual magazine by Willy Ley, but there is an article by R. S. Richardson – although on a different subject from the one mentioned by Hoen. 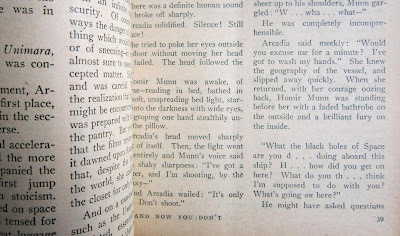 Hoen scored another near-miss in one of the magazine’s two serialized stories – “Gulf” (part 1 of 2) by Robert A. Heinlein. Hoen doesn’t say the story is serialized, and he gives the author’s byline as Anson MacDonald – although he also refers to him as R. A. Mac H., so it’s clear he meant the story to be written by Heinlein (“Anson MacDonald” was a pseudonym Heinlein used earlier in his career). Hoen describes the November 1949 cover as being the work of Hubert Rogers, which it is. As you can see from the photograph above, the cover story is “...And Now You Don’t” by Isaac Asimov. 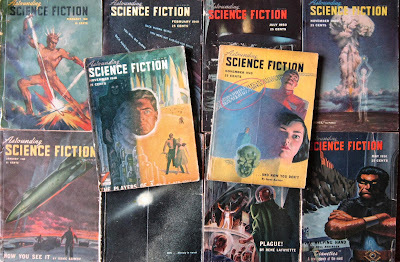 This again is a serial, the first of three parts, which was subsequently published in book form as the final two-thirds of Second Foundation (the first third, “Now You See It...” appeared in the January 1948 issue, seen in the bottom left of the photograph). But Hoen doesn’t mention Asimov at all in his letter. In his version of the magazine, the cover story is “We Hail” by Don A. Stuart – a pseudonym that Campbell himself used on a number of stories back in the 1930s. You might imagine this would be the easiest part of the prophecy for Campbell to make come true, yet he didn’t. Maybe, as a full-time editor, he just didn’t have the time or inclination to write a story himself! The actual cover story, by Asimov, contains an interesting bit of “prophecy” itself. On the penultimate page of this instalment, one of the characters exclaims “What the black holes of Space are you d...doing aboard this ship?” There’s nothing odd about that, you might think, because black holes are among the most outlandish and exotic things to be found in outer space. But the use of the term “black hole” in this context only dates from the 1960s! 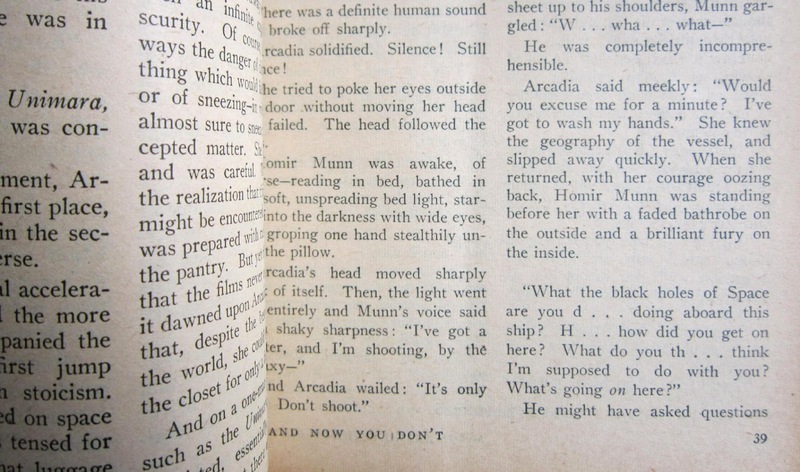 Anyone encountering the phrase in the book version of Second Foundation may imagine it’s a later editorial change, but as you can see from the picture below it was there in the original 1949 magazine! It's fascinating how the vision of the future has changed in just a few decades - when I was a kid in the '70s the future (post 2000 AD) was all about flying cars, robots, cities on Mars etc and now the future is climate change, peak oil, ageing populations, mutated bird flu pandemics etc. Where did all the optimism go ? I suppose reality set in. I couldn't agree more, Colin. It's such a shame all that wide-eyed optimism about the future fizzled out, and youngsters are now brought up to expect a bleak future of dwindling resources and rising sea levels. What's particularly depressing is that, as John Campbell pointed out back in 1949, upbeat "prophecies" about the future may end up fulfilling themselves. If a child is brought up on robots and interplanetary space travel, they're more likely to be drawn into a career in engineering which might actually lead to such things. Although, having said that, Andrew (you, not me), kids in the '60s were brought up with programmes like Tomorrow's World - and yet today's reality doesn't really reflect what was predicted back then, as far as the big picture goes. Hmm. I would say that "our generation" (which peaked in creativity in the 80s and 90s) probably did its bit for progress, and all the cynicism and negativity kicked in after that. But I know I'm probably being biased and subjective!